This is a map of the British Isles. It was published in Paris is 1575 by Francois De Belleforest as part of a French translation of Munster's Cosmographia. Munster was a mathematician, geographer and eminent Hebraist and professor of Hebrew at the University of Basle. In 1544 he published his Cosmographia, a compendium of historical, legendary and geographical information. For this French edition the maps were printed from recut woodblocks. 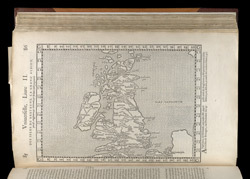 This map of the British Isles is a direct copy of a map which appeared in the modern section of Girolamo Ruscelli's Venetian version of Ptolemy's Geographia in 1561. This earlier map was based closely on the 1546 Lily map which was significant as it was the first separately-printed map of the whole of the British Isles. The outline of England and Wales was based on a map of 1540 by Sebastian Munster. Here the Bay of Cardigan is not represented, following Lily's omission of it. The depiction of Scotland is relatively accurate and detailed, perhaps the result of Lily's possible consultation of a map of Scotland drawn by John Elden and presented to Henry VIII in 1538.